How Far is Spero Bonsai? The bonsai tree has all the grandeur of a full fledged tree yet fits comfortably in the palm of your hand, It is this very essence that we have captured at Bonsai. Though a petite three-apartment complex, Bonsai rivals the biggest of establishments in terms of luxury and comfort. 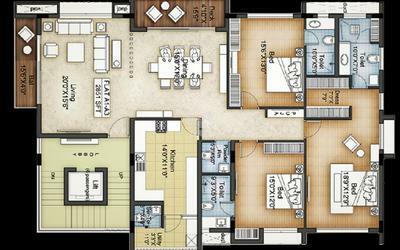 At Bonsai, the floors have been meticulously planned and executed for your safety and comfort. The living and dining room floors feature only the finest imported marble. The bedrooms have laminated wooden flooring making you feel right at home. Vitrified tiles on the kitchen floor ensure that stains are never an issue. Both the bathrooms and the balconies have Anti-Skid tiles, So you needn't ever worry about your or your loved ones' safety. Our windows are all Glazed Fenesta (or equivalent) UPVC of the highest calibre. The kitchen features a stately premium granite counter top, perfect for cooking of all kinds. A state of the art Home Automation system integrates and controls lighting in every room adjusting it to the subtlest changes of mood. This control can be extended to the blinds and curtains as well. The apartment features elegant false ceilings with cove lighting. Plumbing & Sanitary: The bathrooms are equipped with every convenience and necessity. Water closets hang from the wall while mixer taps allow for the perfect temperature of water. All bathroom equipment is VILLEROY & BOCH, GESSI, LAUFEN or their equivalent. SPERO is spearheading a new era of real estate with our dynamic business model and revolutionary vision. Each and every Spero project is responsibly sourced and immaculately executed, keeping you in mind. We endeavour to create top-of-the-line homes and office spaces, as well as generate employment and preserve the environment. A vibrant and dynamic real estate company, Spero is involved in leasing of commercial space and is currently expanding into development. Incorporated in 2006, it has grown from strength to strength, with an unwavering commitment to delivering the very best, both in terms of quality and value. With the highest standards in architectural design and construction, international quality building materials, facility management and on-time completion, Spero seeks to offer total customer satisfaction.